In a message to the network’s staff before the New Year’s weekend, Al Jazeera Director General Ahmed bin Jassim Al Thani laid out his plans to reshape the way the news and sports channels, as well as HR and IT branches are organized. He said the reorganization is the result of “best practices and professional opinions from international consulting firms” and sought to address “points of weakness” in the company. Since Al Thani, a member of Qatar’s ruling family, took over the top spot at Al Jazeera from Wadah Khanfar some three months ago, a steady stream of changes have been made, most notably shifts in the Arabic news channel’s management team, a general hiring freeze, and a push to hire more Qatari citizens. Outside observers have been keen to see what impact the ex-Qatargas exec’s changes will have on the two news channels’ editorial directions, although the jury is still out in that regard. The reorganization focuses on putting all of the network’s core division under 9 Executive Directors, and a General Legal Counsel. One of the new positions is Executive Director of News Channels, which would oversee both AJE and AJA. Not all of the directors have been announced, although Ehab Shihab, formerly the deputy managing director of Al Jazeera English, has become the Executive Director of International Operations. That powerful new position oversees all foreign bureaus as part of the network’s plan to streamline and consolidate offices previously run by the English and Arabic news channels. Even before Al Thani took over, corporate restructuring was probably overdue (from this former Al Jazeera employee’s perspective) given the launch of several new channels in recent years without a thorough reorganizing of its chains of command. 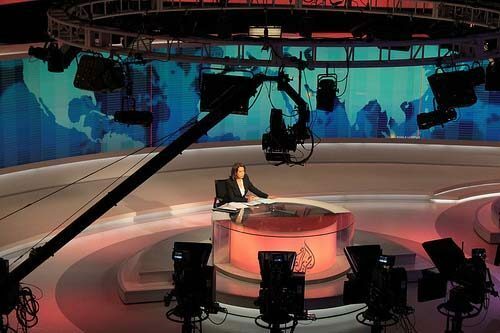 The new organizational chart, however, has not been finalized, as Al Thani says some departments are “still under study.” Other interesting developments in the pipeline at the Al Jazeera Network include improving the onscreen output of Al Jazeera Arabic, and building new studios for the Arabic, English and Mubasher channels.